I have been deeply moved by the World War I war memorials in small towns throughout France. Here in the US, small towns in the North and South have similar memorials to the Union dead and the Confederate dead, respectively. 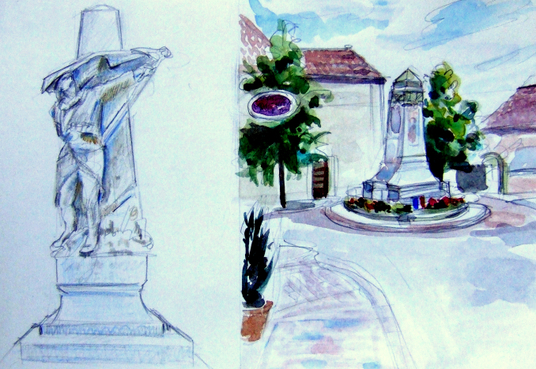 This is a pair of sketches of war memorials from a trip I took to Burgundy 3 or 4 years ago. There are many fewer World War II memorials. The pride of place in each town had already been given to those lost in that other 'great' war. In the smallish southern college town where I live, there's a memorial to the Confederate dead. As I sat on the grass drawing, I felt self-conscious in a way I don't normally while sketching in public. I didn't want passers-by to think that what I was doing was in some way an attempt to glorify the Confederate cause. Nothing, you must know, could be less true. Thank you so much, les amis. Marly, you are right and there is nothing wrong, seen in that light. Larry, what a fascinating-sounding book! I'll try to get my hands on a copy. Oh, I missed this one... an interesting mix of monuments. As for the Confederates, they are dead; they have gone through the great dark. Surely there is nothing wrong with letting a face set in stone remind us that these young boys and fathers and elders were not only one thing--they were many things, some right and some wrong, some noble and some ignoble. 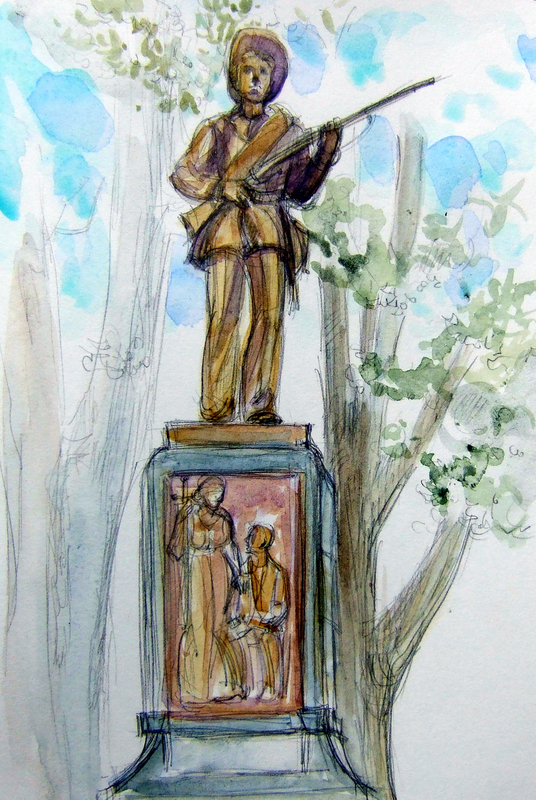 you've captured a sadness and solemnness to the confederate soldier, a wonderful sketch, thank you Laura! your wonderful inspiring pages this month, I hope to remember and apply what I learn from your example of out and about on my upcoming trip, you will be settled in France when I return so I'll miss the premiere but will anxiously tune in to see what I hope will be a wonderful time for you! Laura--the interesting book "Written in Stone: Public Monuments in Changing Societies" talks about war memorials and especially our difficult relationship to monuments to the Confederacy. I've been greatly enjoying your recent art. I visited the graves in France of two of my great uncles (brothers) who were killed as young men in WW1. They were so beautifully kept, so poignant that after all this time, the French still feel moved to honour those who fought and died there in this continuing way. On one Uncle's grave was a beautifully tended miniature rose bush. And this outside a tiny village in the middle of no where. Thanks for the walk down memory lane this morning. Love your drawings. So beautiful. BEAUTIFULLY BEAUTIFULLY DONE!!! YOUR STONE LOOKS LIKE STONE AND FACES ARE SO WELL DONE!!! (I'M SPEAKING FROM LAURA-ENVY HERE, CARA!) JUST SUCH GREAT PAINTINGS, MY FRIEND!